For many home owners, cleaning the rain gutters is the most dreaded chore of the year. Not only is it cumbersome and difficult, but it is dangerous given the nature of the job. Regardless, the rain gutters will clog up every year with leaves, dirt, twigs, and more—this debris can lead to costly repairs in the future if left in the gutter. This is a job that can’t be ignored, so it is best to take a safe, smart approach and use all the tools necessary to get the job done carefully and correctly. Read on for a few tips that will help you tackle this beastly chore without such hesitation and drudgery. Many people are tempted to walk across the roof in order to clean the gutters, but this can be potentially hazardous, as well as risky to the infrastructure of the roof itself. Not only may it be easier to fall than it would be to use a ladder, but you could inadvertently damage the shingles and other materials while attempting to clean the gutters. Although you might think a ladder is more dangerous, this is the best method for thoroughly cleaning the rain gutters and keeping yourself safe. If you can get a little help with this project, it is a great idea to get someone to hold the ladder—especially if your home is three stories. However, it isn’t always easy to find someone who will hold the ladder steady for you while you clean the rain gutters for three hours, so there is a good rule of thumb to help you keep balance. When climbing the ladder, always keep three limbs connected to it while climbing. This could be two feet and a hand or two hands and a foot. It may make the process a little slower, but it will prevent slips and falls that could cause severe injuries. Never try to reach further down the gutter by stretching while standing on a ladder. This will shift your center of gravity pulling it to one side. The tool is already top heavy with you on it, and shifting your weight to either side could cause it to fall. If your home is only one story, look into getting a gutter cleaning tool that doesn’t require a ladder. There are several tools out there that will allow you to reach up and clean out the gutters without climbing a ladder and endangering your safety. Many homeowners don’t think to check the downspouts themselves for clogs or damage. If the downspouts are unable to drain the water fast enough, it could back up and cause water to overflow the gutter. The downspouts should be clear of any debris while keeping obstructive objects away from the mouth of the pipe. 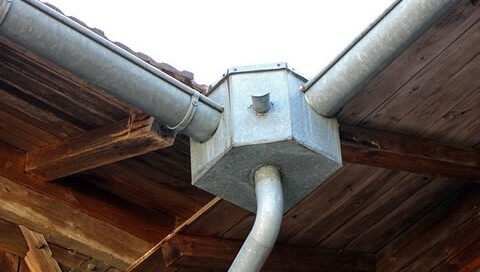 Not only will a cluttered downspout cause clogging, but it will create a comfy home for animals. According to the professionals of APM Pest Control in Salisbury MD, covering the downspout with a mesh cloth will allow the gutter to drain (of water) while keeping rodents and critters from getting in. Many homeowners choose to clean the gutters by pressure washing to get rid of all the debris as well as any remaining dirt. While this is a good method, you want to make sure that you have the correct By using a thinner hose, the water pressure is already increased when it comes out of the nozzle. However, attaching a hand prayer could increase the power to the point of blasting leaves and debris out of the gutter without you stretching to reach certain areas. Clear gutters can be beneficial for keeping the patio clear during a rain storm or assist in preventing ice from forming in hazardous places during the winter. It can also improve the amount of water you collect should you use rain barrels for gardening purposes. Regardless of the benefits, always take precautions to ensure your safety—it could be a long way down to the hard ground below.